Family emigrated to Victoria when he was 5 years old. 1883: A report of the benefit concert for Joe H. Henry said the Carlton footballers went through their dumb bell routine under the direction of their instructor, Professor Miller. "Professor Miller, physical culturist, boxer, and wrestler of note, spent a number of years here in his prime. He fought and defeated Harry Foley for the heavy weight championship of Australia. His forte, however, was wrestling, in which he excelled, having few equals. He acted as an instructor to the police, military, and sundry schools. His father a professor in education, was the principal of King's College, Nicholson Street, now a Salvation Army home. Miller died in America some years ago, age 84." Born circa 1858, aged 72 in 1930. 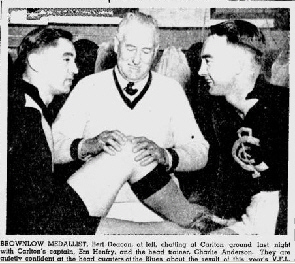 His nick-name "Bonner" was given to him by Carlton legend George Coulthard. In 1885 McKay was property master and trainer at Carlton, a position he held until 1900. He also played football for the Carlton second twenty side. The Australian Star (Sydney) June 28 (p6) 1890, Carlton captain William Strickland was interviewed and mentioned Sam English was the head Carlton trainer. He was a former boxer who had his own gym where the Blues trained. Carlton were in Sydney to play Tasmania, South Melbourne and NSW. The interview took place on a cruise of the harbour with both the Carlton and South Melbourne teams.
.* att maybe a misprint of Batters or Wyatt.
.* misprint of South? Could also be J. Wyatt with the South Melbourne club who was a noted runner.
.* ra, maybe the word - rather. 1894 Above, King Mitchell Richmond trainer 1888, Carlton trainer 1894. Jack Worrall writing in the Australasian September 03 1932 (p48) says, "King Mitchell one of the founders of Richmond." 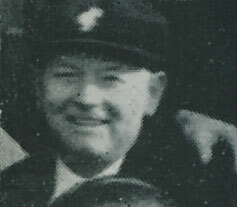 Norman Bragge was the of nephew Carlton player George Bragge and the father of Les Bragge a 1940's Reserves player. 1917 Bert Snell (chief), H. Sampson (property master), Stan Barry, Dan Barry, A. Linnington, C. Campbell. 1917 P. Sweet (trainer) mentioned in The Herald May 04 (p3) as one of Carlton's serving soldiers. 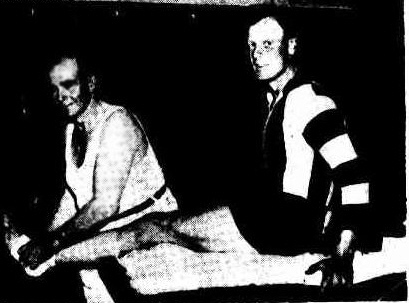 The Argus May 1947, Charlie Anderson has been the head trainer at Carlton for 22 years. 1925 E. Leslie - Carlton and Victorian team trainer, appointed head trainer of fledgling Hawthorn club. 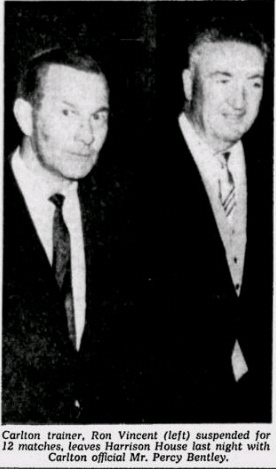 Another report says former player Dr. Phil McCumisky replaced the long serving Dr. E. A. Strahan in 1932. Chiropodist: Thomas Robertson for Carlton and Essendon. Trainers First Semi Final; Ron Kee, Harry Crompton, Perc Gillett. 1951: Charlie Anderson (Head Trainer), Harry Crompton, George Harrison, Ron Kee, Hector Maggs, Bob Sutcliffe. Training Room Staff: C. Anderson (Head), H. Crompton, George Harrison, R. Kee, H. Maggs, R. Sutcliffe and R. Vincent. Training Room Staff: C. Anderson (Masseur), H. Crompton (Head), George Harrison, R. Kee, H. Maggs, R. Sutcliffe and R. Vincent. Training Room Staff: C. Anderson (Masseur), H. Crompton (Head), George Harrison, H. Maggs, R. Sutcliffe R. Vincent and O. Vincent. 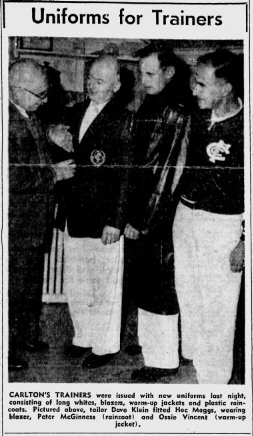 1969 Ronald Dale Vincent, a Carlton trainer of 25 years, was suspended for 12 weeks for throwing a football in the face of Richmond's vice captain Mike Patterson. Ron was the first trainer to be suspended by the League. 1976: R.Vincent (Head), R. Ebbage, G. Harrison, J. Taylor, R. Lambert, G. McColl. 1979: R.Vincent (Head), J.Taylor, G.McColl, J.Kidney, Derek Cramer & J.Carney (Training Room Supervisor). 1981: Ron Vincent (Head), Jim Taylor, G. McColl, Mick Scanlon, Leon Bazin, Albert Young, Keith Leitch, Henry Phillips and Derek Cramer . Contributors to this page: blueycarlton , Jarusa , pblue and Bombasheldon . Page last modified on Monday 11 of February, 2019 10:39:22 AEDT by blueycarlton. 1973 GF - Garry Crane: Carlton's best player. 1995 GF - Justin Madden wins another centre hit-out.